Several weeks ago the first half of this glossary was provided. As mentioned then, every sport, hobby, or business has a collection of special terms, sometimes called ‘jargon’. This goes for pinewood derby racing as well. So here is the second part of the glossary. If you find a term I have missed, please e-mail them to me and I will update the glossary at a future date. Ballistic Stoppers – Removable devices that can be placed on the braking section of the track to more quickly slow down cars. Braking Section – A final section of a track used for slowing down cars. Center Guide – A track type on which cars straddle a lane guide. Elimination – A method of racing which narrows down the field by eliminating losing cars. Garage – A stopping device generally made of foam rubber placed at the end off a track into which the cars roll. Judge – A device (or person) that determines the finish order, but does not capture the heat times (not to be confused with “The Judge”, a product by New Directions which can be equipped with a timer). Lane Rotation – A method of racing whereby each car races the same number of times on each lane, and with the widest possible variety of opponents. Variations include Perfect-N, Partial Perfect-N, and Complimentary Perfect-N.
Laser Gate – A system which starts the heat timer when the first car breaks a light beam, instead of when the starting gate is tripped. Side Guide – A track type on which cars rest between two lane guides. Starting Pins – The posts behind which cars are held at the starting line. Stearns – A method of racing which assigns cars to specific lanes for each heat. Generally this method has been replaced by ‘Lane Rotation’ methods. Timer – A measuring device which captures the heat time on each metered lane. Alignment Tool – A plastic gauge capable of making several measurements to better align the wheels of a car. Go/No-go Box – A device used at inspection to determine if a car meets the race specifications. Pro-Axle Press – A tool for straightening nail-type axles. Pro-Body Tool – A drilling guide for creating axle holes, or for making pilot holes in axle slots. Pro-Bore Polisher – A tool for polishing the wheel bore. Pro-Hub Tool – A tool for squaring and/or coning the inside wheel hub. Pro-Outer Hub Tool – A tool for squaring the outside wheel hub on BSA wheels. Pro-Wheel Shaver XT – A tool for truing and machining the tread surface. Wheel Balancer – A tool for identifying the heavy side of a wheel in order to balance the wheel. Wheel Mandrel – A tool for holding a wheel in a drill or lathe in order to polish or machine the spinning wheel. Calipers – A device for accurately measuring thickness, depth, etc. Commonly used for measuring the diameter of wheels and axles. Certified Test Weight – A weight certified to be highly accurate. Commonly used for verifying/proving the accuracy of a scale. Chisel – A hand tool with a sharp beveled edge for removing excess wood. Commonly used for creating pockets for ballast weight. Clamp (C-type) – A holding device in the shape of a ‘C’, used for holding the block of wood for drilling, cutting, etc. Drill Bit (Brad Point) – A type of bit with ‘flutes’ for drilling clean accurate holes in wood. A sharp tip ensures that the bit does not wander. Drill Bit (Forstner) – A type of bit without ‘flutes’ for drilling very clean accurate holes in wood. A sharp tip ensures that the bit does not wander. Drill Bit (Fractional) – Drill bits measured in fractions of an inch, e.g., 1/8, 3/16, 1/4, etc. Drill Bit (Numbered) – Drill bits measured in number units, e.g., 44, 45, 46, etc. Numbered bits have much smaller increments than fractional bits. Level – A device to verify the evenness of a surface. Commonly used for adjusting a track, or for adjusting a test surface to be used for aligning a car. Saw (Coping) – A light handsaw with a slender blade stretched across a U-shaped frame, used for cutting designs in wood. Saw (Hack) – A handsaw having a narrow blade stretched in an iron frame, for cutting metal. Commonly used for making accurate cuts in wood, and for cutting new axle slots. Shim – A thin piece of material used for making fine position adjustments. Waxed paper is commonly used as shim material for making adjustments to the alignment of a car. Square – A device for marking and measuring right angles. A common type is the ‘Combination Square’, which also marks 45 degree angles and can be used as a ‘level’. Vise – A fixed holding device with strong jaws. Commonly used to hold a car body for cutting, drilling or shaping. Wood Filler – A water-based, paintable substance used for filling gaps and flaws in wood. Wood Putty – An oil-based, generally non-paintable substance used for filling gaps and flaws in wood. X-acto Knife – A brand of razor knives used in hobby work. Chuck – The portion of a drill or lathe which holds the drill bit, mandrel, or other object. Flutes – The spiral grooves on a drill bit for channeling cut wood out of the hole. Kerf – The width of a saw blade. When cutting new axle slots, the kerf of the blade should match the slot width. Ballast – Any weight used to increase the mass of the car. Hobby – Typically zinc formed into a variety of shapes. Lead – A soft, heavy metal used as ballast weight. PineCar – Same as ‘Hobby’. Plate – Zinc weight formed in a thin plate for attaching underneath a car. Tungsten – A hard, heavy metal used as ballast weight. Zinc – A hard, light metal used as ballast weight. Bore – The hole through which the axle passes. Face – The sides of the wheel, the side facing away from the car is the ‘spoke side’ or outside face, while the side facing the car is the inside face. Hub – The portion of the wheel on which the axle head rubs (the outside hub), and which rubs on the car body (the inside hub). Inside edge -The portion of the wheel which rubs against the lane guide on ‘center guide’ tracks. Outside edge – Portion of the wheel which rubs against the lane guide on ‘side guide’ tracks. Spoke side – The outside face of the wheel. Sprue mark – A mark on a wheel formed during the molding process. It corresponds to the opening in the mold through which the plastic is poured. Tread – The portion of the wheel which touches the track. Balsa – A very light-weight wood. Commonly found in hobby shops, it is useful for making accessory parts for pinewood derby cars. The BSA Space Derby and Raingutter Regatta kits are made from this wood. Basswood – A soft, light-colored, even-grained wood. Also known as Linden. Commonly found in hobby shops, it is useful for making accessory parts for pinewood derby cars. Pine – Any of a variety of soft, light-colored woods used for pinewood derby kits. Ponderosa Pine – A soft western pine. Sugar Pine – A soft, western pine noted for a sweet smell. White Pine – A soft eastern pine. Yellow Pine – A hard, southeastern pine with a yellow color. Also know as Longleaf or Shortleaf Pine. 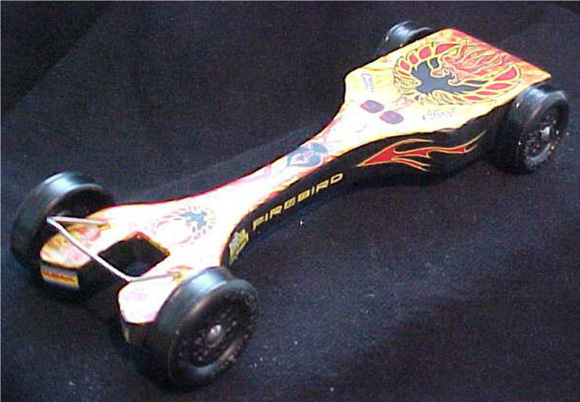 We used your Low Rider design with the Fire Starter Body Skin and the Custom Design decals. As you can see we made a ‘quick start’ modification To The front of the car by cutting a 1 1/8″ L x 3/4″ W channel and adding a paper clip. The car started rolling before the other cars. Stevie went 10-0 and became the Pack Grand Champion in his first pinewood derby race. Now we’re off to the district finals, and hopefully the regionals after that!! My wife wanted to enter a car in the Outlaw Division this year. So I built this three-wheeled snake. I can’t take credit for the idea, as it was inspired by a photo I found on the web (if you know the name of the original designer, please let me know). The car was the fastest in the race, but was unstable. On the last heat it jumped the track, so it ended up in second place. During testing I had to add a ‘crutch’ (not in the photo) on the back left of the car. The crutch kept the front end from lifting too high when the car went through the transition. This is our version of a “car phone”. Based on the Wing design, an extra piece of wood was crafted to fit on top. A small Velcro circle is used to hold down the top during the race. The most difficult part of building the car was recessing the hinge so that it didn’t stick out the back, making the car too long. The car took 1st Place in Speed and Design. I recently read an article that claimed that a group added the weight inside the wheel. Have you heard of this and how beneficial is it? 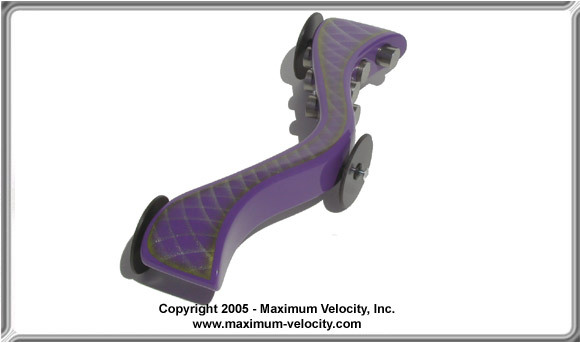 Adding weight to wheels will slow down the acceleration of the car. 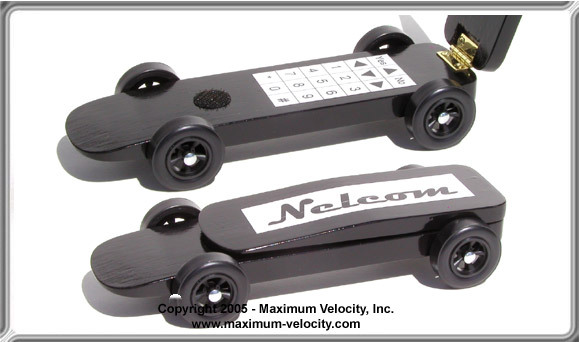 Although a car with weighted wheels may roll for a greater distance than a car with light wheels, it can never catch up with a car with light wheels on a typical pinewood derby track. How large does an object need to be to trigger an electronic finish line? I’m asking because I’ve seen many car designs that have a wire for the front of the car, often mounted high to take advantage of the starting gate drop time. Per feedback from electronic finish line vendors, a wire may not be enough to consistently trip the line (although it can work as found out by Stevie Banks (see Car Showcase section). To ensure consistent tripping, an object of at least 1/4 inch thickness should be used. If a wire is used for the front, then you can stretch some tape (maybe metallic) across the front. The first two years my son competed in his pinewood derby he painted his entire car and then clear coated it. The last two years we have left the area where the inner wheel hub touches the body unpainted. Which of these do you think makes a slicker surface (or faster car)? I prefer the clear coat, but in either case, if you are using graphite as the lube, then rub some graphite on the area.